Apricots are one of the great treats of summer. Rather than buying them at the supermarket, consider growing them at home, where the small, attractive trees are ideal for inclusion in an edible landscape. 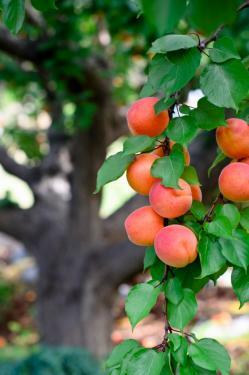 Between their fruit and beautiful form, apricot trees offer something for every season. And in every season, they need just a bit of care to ensure that they thrive and produce abundantly. Apricot trees take on a beautiful, gnarled form as they age, which makes for a striking silhouette when they are bare in winter. 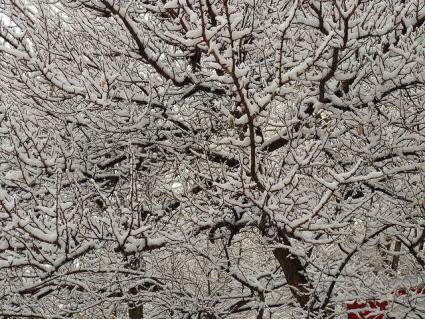 It's also important to note that apricots need a certain degree of winter chill - defined as hours below 45 degrees - to set fruit. If you live in a place with mild winters, be sure to look for one of the low-chill varieties. Late winter is the preferred planting season for apricots when they are available as bare root trees without a pot of soil. This allows the roots to splay out in a natural pattern, rather than being coiled up in a pot, making for easier establishment and a stronger tree in the long term. Plant them as soon as the ground thaws in a location with at least eight hours of direct sun in summer. 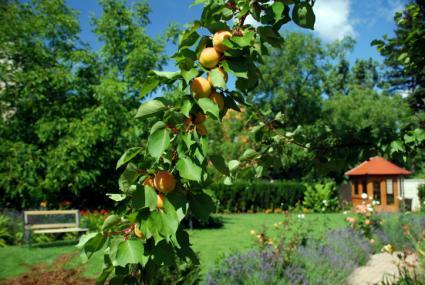 Apricots should be pruned once each year while they are dormant. The goal of pruning is to create a scaffold of three to five main branches evenly spaced around the trunk of the tree, pruning out sprouts that grow toward the center to create a vase-like shape. It's also good to thin out the many tiny side branches leaving one about every eight inches - this is where the fruit will form. The main pests that homeowners have to worry about on apricot trees are fungal pathogens. There are many that can appear, especially in cool damp climates. Symptoms may include discolored leaves and fruit, and sap that oozes from the branches. Preventative measures like planting the trees in well-drained soil and disinfecting pruning equipment before pruning is a good idea. It is also wise to rake up fallen leaves and rotten fruit at the end of the growing season, as many pests overwinter in them. Spraying a combination of copper- and sulfur-based pesticides in late winter is also recommended as a sanitary practice to prevent disease outbreaks in the following growing season. These are naturally-derived products, but they can still be harmful to people and the environment if not used correctly, so be sure to follow all instructions on the bottle. 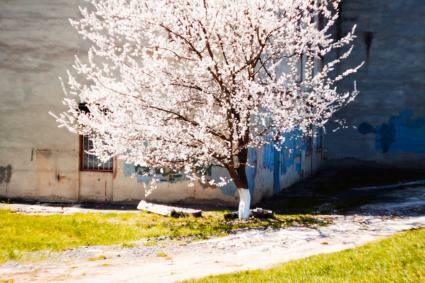 Apricots are one of the first trees to flower in spring, when they are covered in white flowers tinged with pink, and honeybees come to enjoy their nectar. Apricots bloom so early that winter is not always quite over and the flowers are easily damaged by late frosts and stormy weather, meaning they will not be pollinated and there will be no fruit for the season. For this reason, some people plant apricots near a north-facing wall, where they stay dormant until the sun is high enough in the sky (later in spring) to awaken them and provoke the flower buds to open. Spring is also the season of growth for apricots. They have relatively low fertility requirements but a dose of all-purpose fertilizer, like 10-10-10, scattered over the root zone once per month will help them to produce more abundantly and have the strength to resist attack by pests and disease. Depending on the variety, apricots ripen in June, July, August or September when the orange orbs begin to look like ornaments on the tree. Harvest them when they become soft to the touch, but ideally before they drop to the ground to prevent bruising. For the biggest, tastiest apricots, it's a good idea to remove some of the fruit, concentrating the tree's energy in those that remain. Some fruit will drop on its own, as a form of self-thinning, but a general rule of thumb is to remove enough of the immature fruit so that there is about three inches between each one that is left to mature. Apricots are surprisingly drought-tolerant once established and it is important to not overwater the trees, as this can contribute to fungal problems and fruit that tastes 'watered down'. However, newly planted trees will need water once per week in the first growing season. You can reduce this to every other week the second year, every three weeks the third year and so on, until you're giving them a deep soaking once every six weeks in the sixth and subsequent years. 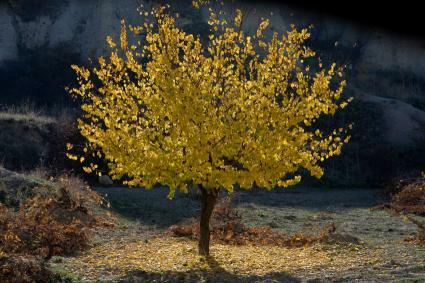 Apricots are resplendent in autumn when the petit heart-shaped leaves turn golden yellow before dropping to carpet the ground. There's not a lot to do for apricots in fall, other than spreading a layer of mulch around them to protect the soil from torrential winter rains. This also serves as a source of organic matter to feed the beneficial microorganisms in the soil for the coming year as it breaks down. Dave Wilson Nursery is one of the largest growers of fruit trees in the world and is known for its top-quality trees, including a collection of 27 apricot varieties. They do not sell to the general public, but you can ask your local garden center to order from them for you. The Arbor Day Foundation is a non-profit organization that supports planting trees as a way to take care of the environment and improve conditions for people. They offer a variety of apricot called Moorpark for $17 plus shipping, though the price is only $10 if you are a member. Peaceful Valley Farm Supply has been selling organic gardening supplies for almost four decades and offers a dozen different apricot varieties ranging from $20 to $30 each plus shipping - but if you buy ten or more trees the shipping is free. There is nothing like the flavor of homegrown fruit and apricot trees are one of the easiest of tree fruits to grow, especially if space is limited. The trees are a delight throughout the year and the fruit can be dried to enjoy as a nutritious snack when it is not in season.